Laurie, Kelly and I assembled at Laurie’s house to watch the Academy Awards. 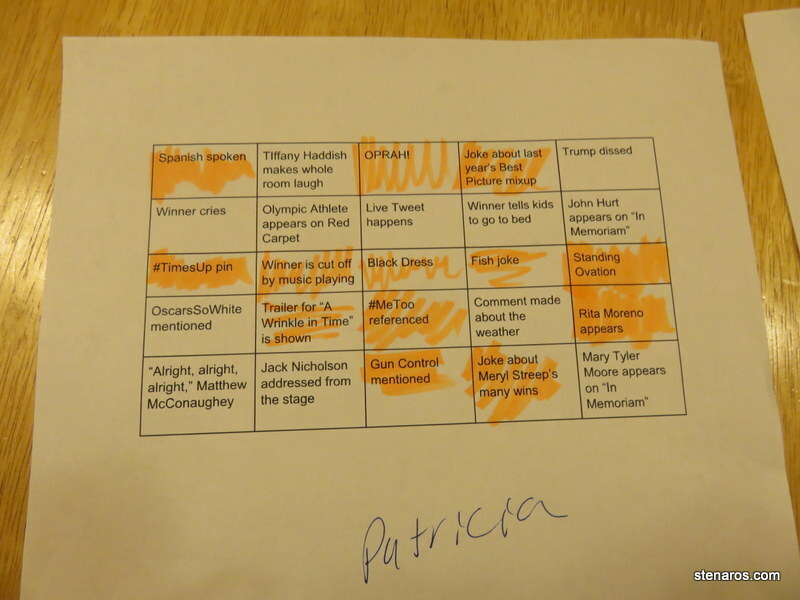 Kelly wrote up a BINGO game, which I won. I created a new game called the Happiest Oscar Viewer wherein you pick all the people/movies you WANT to win. This is different from picking who you think will win. 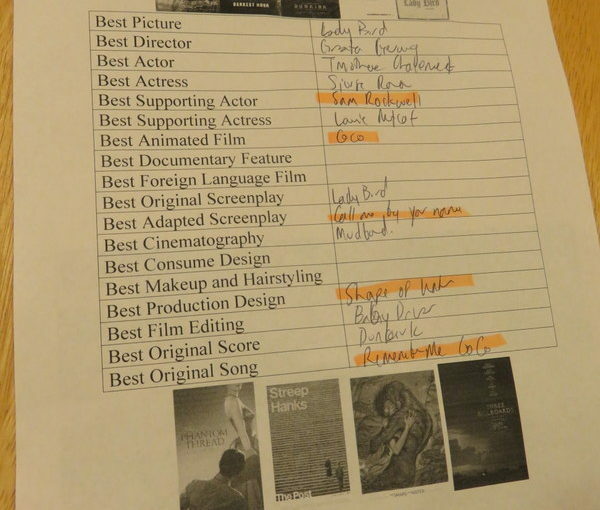 As the winners are called, you highlight any of your picks that the academy agreed with, and the person with the most highlights is the Happiest Oscar Viewer. Overall, it was snoozer of a ceremony. And I have pretty high tolerance for Oscar ceremonies. I like the new game idea! That’s a fun twist… It was a bit ho-hum. That’s why I DVR it and start watching it late enough that I can fast forward through the drivel. What qualifies as drivel for you? Ads and some speeches/skits/silly bits…but mostly just the ads! 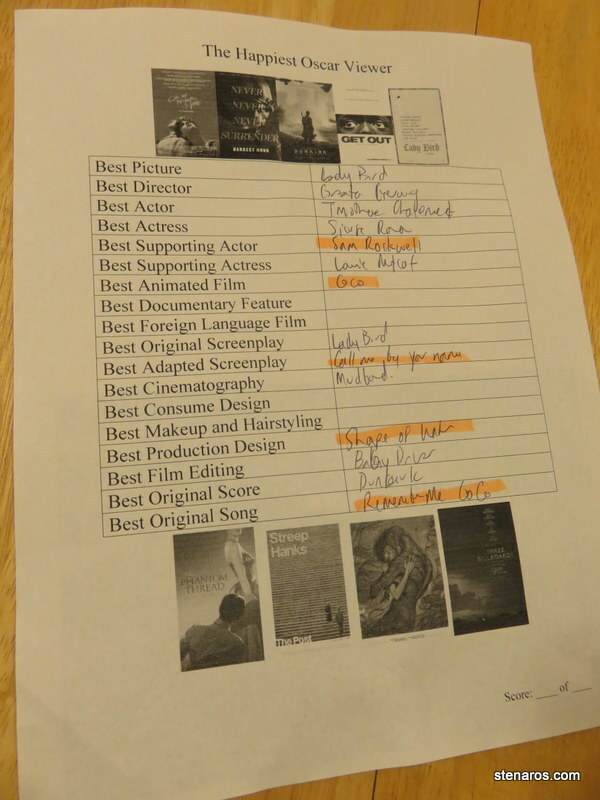 And even so, I was not the happiest Oscar watcher, if I remember correctly…. Yes, you were a trooper, still hosting that party while being under the weather. You deserved to win the happiest Oscar watcher prize!